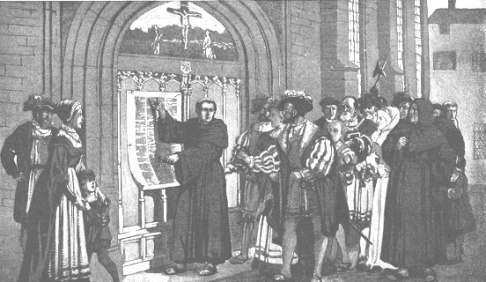 As I mentioned yesterday, it was 492 years ago today that Martin Luther nailed his 95 Theses to the door of Castle Church in Wittenberg. The official title was “Disputation of Doctor Martin Luther on the Power and Efficacy of Indulgences” and its viral spread led to the Protestant Reformation that has had seismic effects in world culture for nearly five centuries, even though more Americans associate October 31 with goblins and overdosing on high fructose corn syrup than with theological and cultural revolutions. Today I created a new page on SMUG on which I have posted my 35 Theses, entitled “Disputation of Chancellor Lee Aase on the Power and Efficacy of Social Media.” Instead of nailing them to the physical community bulletin board as Luther did, I’m posting them on the wall of a virtual university. And while Luther’s theses unintentionally sparked a revolution, mine have the goal of sparking discussion and disputation about a revolution that is already well underway. I’ve seen several videos of this genre, but one thing I appreciate about this one (as opposed to the “Shift Happens” series) is that it focuses on what has already happened (which is amazing enough) instead of projecting things like “By 2049 a $1,000 computer will exceed the computing capabilities of the human race.” I also like this recent video, Did You Know 4.0…which only makes one really outlandish extrapolation at the end, but in that it was at least quoting someone. So while the videos above provide support for Thesis #4 — Social Media are the third millennium’s defining communications trend — my 35 theses are more about describing the revolution than causing it. What I do hope to accomplish, though, is to help health care organizations (and other risk-averse businesses and groups) understand that the social media revolution isn’t a fad, that it will affect them and — most importantly — that it can be immensely beneficial if they look for ways to take advantage of the opportunities inherent in social technologies. I look forward to writing posts over the next month or so that will amplify and illustrate many of these theses, and to having others refine and improve them. And since I only started with 35, there’s plenty of room for you to suggest more. We’ve got a long way to go to match Luther’s 95. As I have been asked to keynote some conferences on social media in healthcare I have found it necessary, or at least desirable, to take a broader view of the topic instead of just describing our Mayo Clinic experience. Don’t get me wrong: I actually think our Mayo Clinic experience in social media, and the story behind it, is probably the most important contribution I can make to the discussion. After all, philosophy is cheap. Anyone can pontificate on what “should” be done, but having a concrete story to tell of how social media have actually been implemented is more valuable. But sometimes it’s helpful to also be able to generalize from the specific, to help elucidate underlying principles that the specific examples illustrate. As I was preparing for Healthcamp Minnesota and that keynote, I was drawn to develop some basic principles for healthcare social media. And being of a Reformed Christian background, I couldn’t help noting that we’re coming up on Reformation Day, October 31 (other folks call that day “Halloween”), which is the 492nd anniversary of the day Martin Luther nailed his 95 Theses to the church door at Wittenburg, Germany. Because of a technology that had been developed relatively recently, the Gutenberg printing press, Luther’s theses went “viral” and changed the course of history. They were translated from Latin into German and spread throughout Germany within two weeks, and throughout Europe within two months. So although I have no delusions about the relative import of my thinking compared with Luther’s, tomorrow I’m going to post my own set of theses relating to social media, and will invite your feedback and participation, or even disputation. Just as technology gave viral reach to timeless truths as recovered by Luther, today’s social technology will enable these social media theses to spread rapidly (if they’re any good). It’s a testament to the advance of technology that within two days of publication (based on what I see in my Google Analytics), these theses will likely have been read on six continents. Luther’s theses had eternal significance for people’s immortal souls. Mine might just help you better understand the communications and marketing landscape, and thereby achieve some of your more temporal goals. Luther wanted to start a discussion or an argument, even though he was fairly convinced he was right. I likewise hope to spark discussion with my social media theses, and some of that will take place starting Monday in Las Vegas at the Healthcare Internet Conference. But to paraphrase Luther’s request, if you are unable to be present and debate orally with us, I hope you will do so by Tweet, comment or blog post. Check back here tomorrow for discussion and disputation. Doesn’t 6-11 servings a day of Twitter encourage the kind of inane celebrity updates on personal minute-by-minute activities that give Twitter a bad name? This seems like a tool-centric tactical approach, not a strategic tailoring of the tools to the particular objectives of the organization’s social media program. So here’s some amplification of what a “serving” means. To qualify as a serving your tweet, status update, video or blog post needs to…serve. Others, not just you. Any “servings” that don’t serve are actually subtracted from your total…they’re the social media equivalent of what Mom used to call “empty calories.” No nutritional value whatsoever. In the food pyramid a serving is something you consume. In the Social Media Pyramid a serving is something you produce. It has to be of value to others to qualify. Otherwise it’s a negative. Five good tweets plus two pointless, self-promotional or “spammy” ones gives you a net of three servings, not seven. And some might even say a bad tweet is worth -2. So in answer to the first two questions, I would say that the more real, valuable servings you provide, the more your influence will grow. And the more garbage you post, the more likely your Twitter followers leave, your Facebook friends and fans bail on you and you lose subscribers to your YouTube videos or your blog posts. The third point, about strategy vs. tool-time tactics, I’ll tackle in the next post. And maybe I’ll expand on the serving scoring system. Does this “net servings” guide make sense to you? How would you change it?